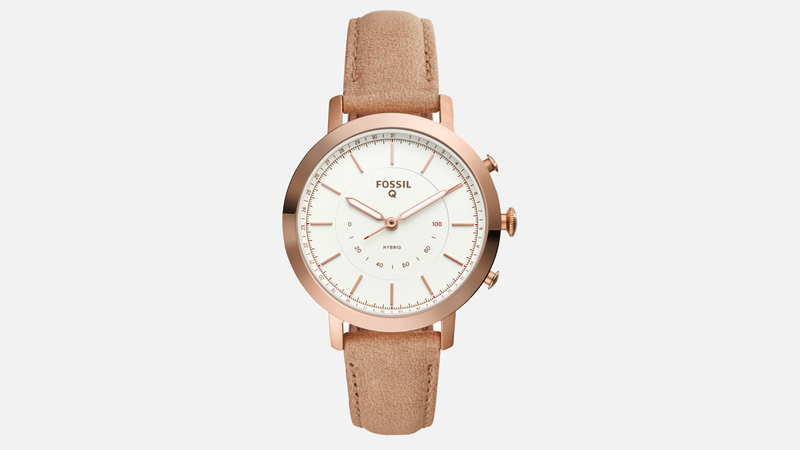 Fossil looks like it's on to a women-friendly winner with its new line of fashion hybrid smartwatches. The £159 Q Neely and Q Jacqueline styles are both 36mm-wide watches, making them the smallest hybrids Fossil has built to date i.e. more on a par with the smaller Apple Watch than larger smartwatches, and smaller than the 38mm Fossil Q Accomplice. They're also both based very closely on popular Fossil ladies' watches. 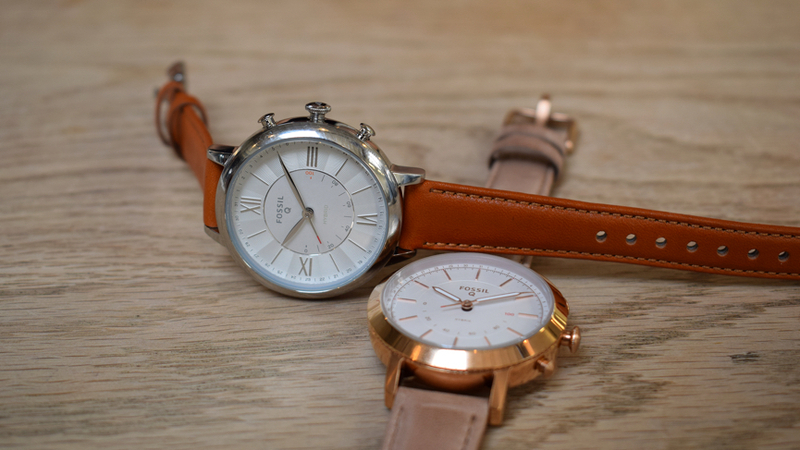 The regular Neely, for instance, is a 34mm three-hands watch with a leather strap and you have to look hard to spot the differences with the rose gold finish Q Neely above. There are three SKUs for Q Neely and four for Q Jacqueline, which include a burgundy face and strap. They also measure 12mm in thickness. The dial in the middle of the watch face keeps track of daily activity and two 'pushers' now flank the crown for features like taking remote selfies, "find my phone", controlling music and now, for late 2017, starting a stopwatch or even getting an ETA on your commute. There's no screen but the Q watches will vibrate when you get a notification plus you can, if you like, set the watch hands to indicate who is calling or which app has an alert. Health and fitness wise, it tracks steps, calories burned and sleep, battery life is still up to six months on one coin cell and straps will come in leather, silicon and stainless steel, to match the watch body. The 'dumb' Jacqueline has Roman numeral indices on the white watch face - we'll add press pics of this when we get them. The Fossil Q app for iOS and Android has also had a revamp with a redesign of the interface to make it more 'streamlined', your most used features now on the home screen and fresh visualisations to help to keep you motivated towards hitting your health and fitness goals. In our quest to find something as small, light and comfortable for lady wrists as the (late, great) Pebble Time Round, which is just 7.5mm thick, the two new watches look like fresh favourites as possible alternatives. 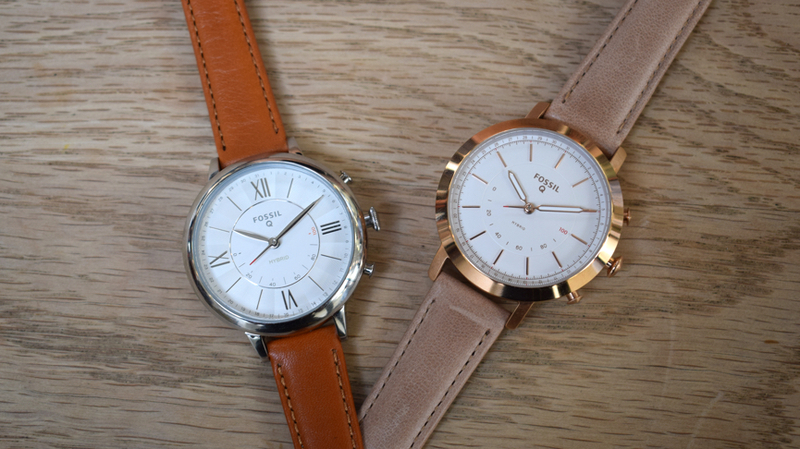 We got a sneak peek at both the fresh Fossil Q hybrids and the similarly dainty new Skagen Signatur T-Bar and it's obvious as soon as you get one on your wrist the leap from previous models. Fossil Group will be hoping that there are millions of customers who would wear this style of watch but may have not entertained bigger, heavier models - and they could well be correct. The Skagen hybrid is also a 36mm watch with a 16mm strap though it is still a noticeable 12mm thick; we're sure these millimetres will be chiselled away in future editions. We don't have the exact thickness or weight of the Fossil Q Neely and Jacqueline yet. 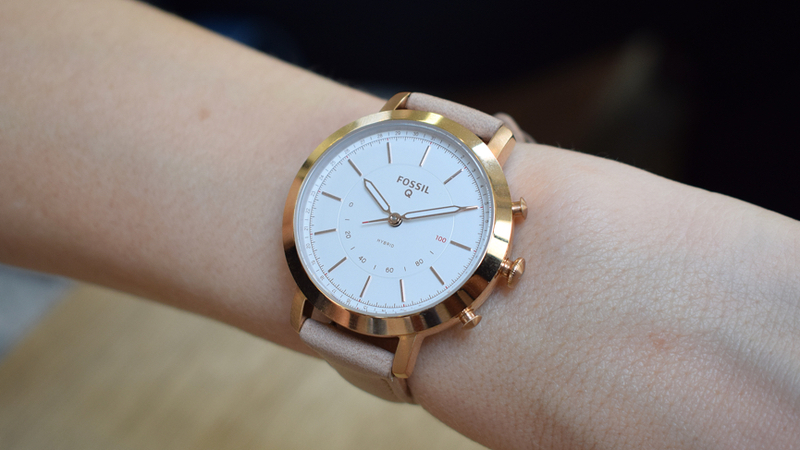 We also recently got a look at the new $495 Michele Connected hybrids, also part of Fossil Group's big hybrid push. These are 38mm in diameter with black, silver, gold and rose gold options and the choice of an 18mm alligator strap. The Fossil Q Neely and Q Jacqueline styles are both £159, less than double the price of the trad watches, and will go on sale pretty soon. 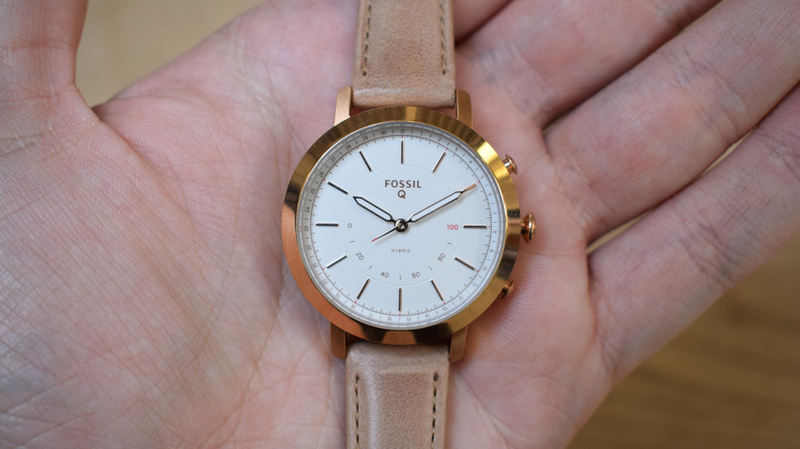 Check them out from 22 October in Fossil stores and online.